Seriously easy chicken pho! 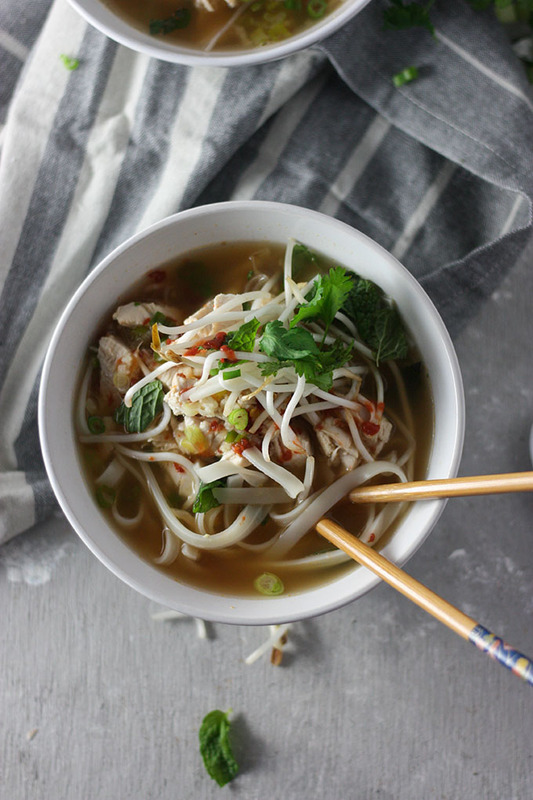 A classic spicy Vietnamese soup that will make you feel good from the inside out! 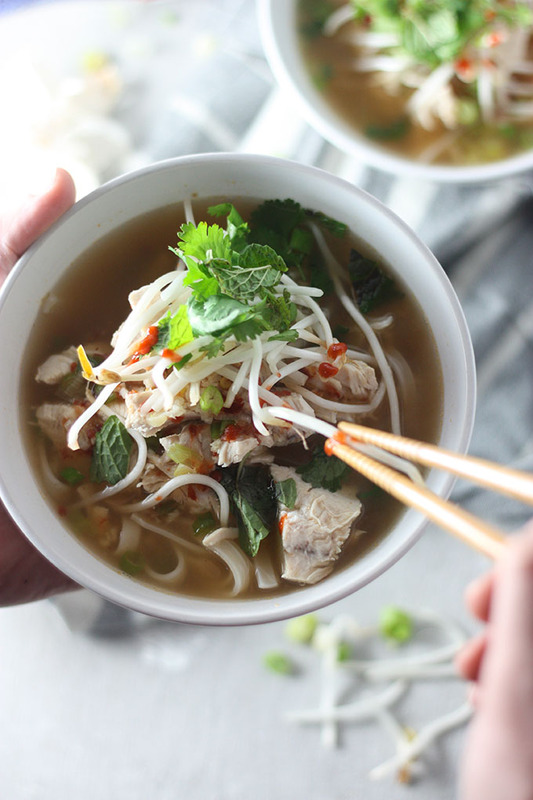 Chicken pho (pronounced ‘fuh’) is a classic Vietnamese spicy rice noodle soup. My brother actually introduced me to pho back in Melbourne, there was a little restaurant called ‘I Love Pho‘ that I guess is not so little now, that did seriously good pho. I had a craving for chicken pho last week and Adam and I found this beautiful little Vietnamese restaurant on our way back from the snow! It’s exactly what I needed. I was practically freezing, so nothing better was downing a massive fresh soup! Oh and shrimp cakes, and maybe even some spring rolls luck, we were starving! 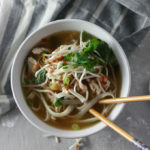 I love the freshness of this easy chicken pho recipe, with the combination of the spicy from the sambal oelek, and the freshness of the mint, coriander and bean sprouts. I always feel better after eating chicken pho because it seems to clear out the insides with the spice! Although I am a spice sook, I don’t find this recipe overly spicy which is great! 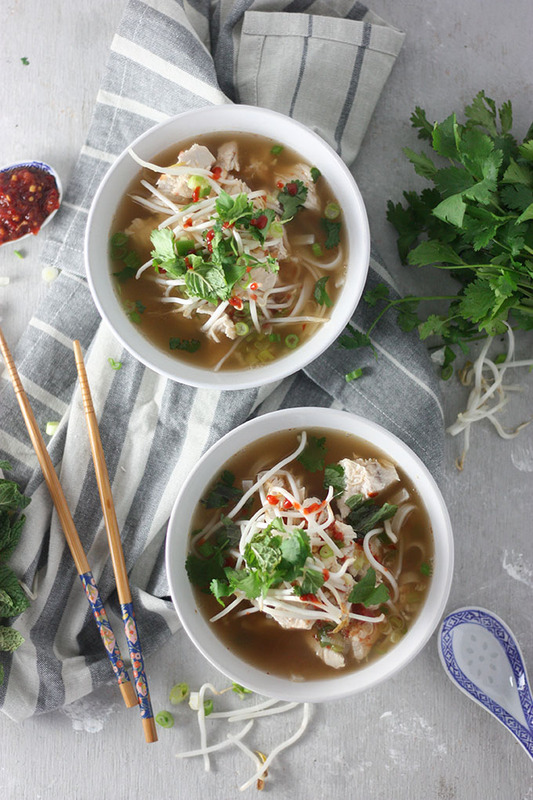 This easy chicken pho is actually perfect for the winter time, and for summer actually really. It is SO fresh you won’t believe the flavour that can come out of tiny jar of chilli, some lemongrass and some classic Asian sauces. There is something about soups that just make me so happy! if you can’t find sambal oelek, use sriracha instead. Sambal oelek is just ground chilis and can be found in most supermarkets or Asian grocers. Sriracha will still be spicy, but a little sweeter so if you want a bit more of a kick, up the sriracha amounts. lemongrass can be fresh or jar. I actually prefer to use store bought lemongrass because I feel like I don’t waste as much as I do with fresh lemongrass. the rice noodles are the thicker rice noodles that are found in most supermarkets and Asian grocery stores. 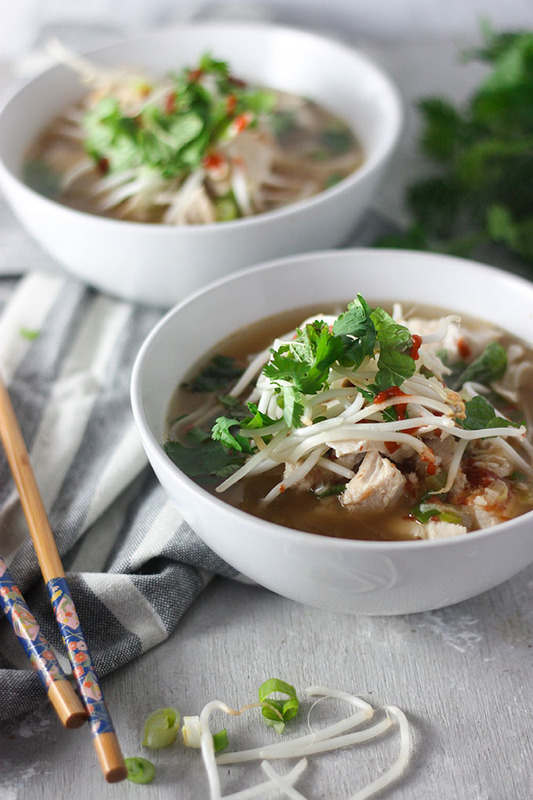 This easy chicken pho is really that – simple, fresh and flavourful! And perfect for cozy winter days when it’s cold and snowy outside and you need a filling soup to warm yourself up! 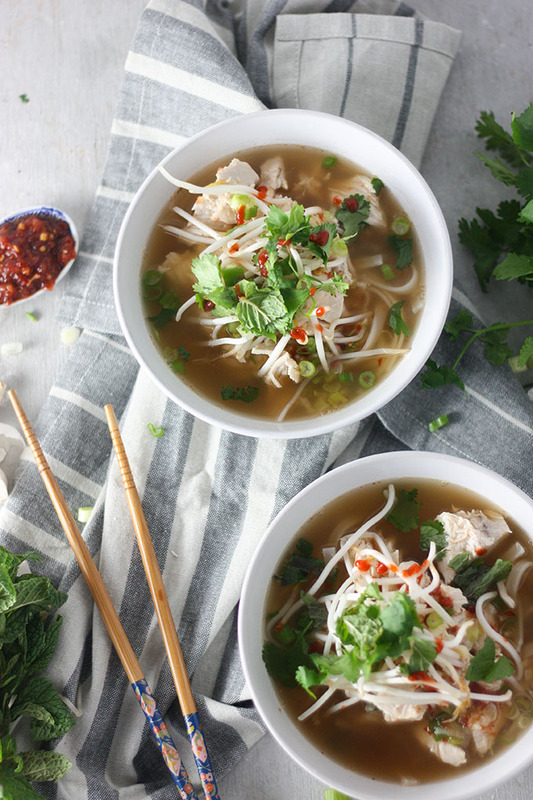 A classic Vietnamese noodle soup, this chicken pho is quick, fresh and healthy! Made with super fresh ingredients, rice noodles and fresh herbs, this is a great weeknight dinner for any occasions. My chicken pho recipe tastes just like the real deal, and will make you feel so good on the inside! In a saucepan, place the chicken breast, 1 chicken stock cube, 1 teaspoon ginger, 1 teaspoon of lemongrass and enough water to cover the chicken. Simmer chicken over medium heat until poached and cooked through (about 20 minutes). Shred chicken and set aside. Bring stock, ginger, lemongrass, fish sauce, garlic to the boil. Once boiling, remove from heat and add green onions and sambal oelek/Sriracha. Place noodles in a large bowl and cover with boiling water. Leave for 10 minutes or until noodles are tender and cooked through. Place rice noodles in a bowl, top with cooked chicken and then the broth. Top with coriander, mint and bean sprouts and enjoy! Sambal Oelek is relatively easy to find in most Australian supermarkets, but I haven't found it harder to find in regular American supermarkets, so I ended up using Sriracha instead. If you are using Sriracha, you may want to use a little bit more than 1 tablespoon depending on how spicy you like it! Sriracha is a lot milder compared to Sambal Oelek so keep adding a little bit at a time until you reach your desired taste. Sambal Oelek is quite spicy which is why we recommend to only use 1 teaspoon. You can also just blitz some fresh red chilis in a food processor as well for flavour, basically the same thing as Sambal Oelek! Join the discussion! Have you had pho before? What’s your fav winter warming soup? This recipe first appeared on the blog back in March 2016! Since then it’s been updated with new content and images! If you loved this recipe, I’d love for you to leave a comment and review! Omg yay yay yay thank YOU for this! Such an amazing recipe, Girl!!!! Homemade pho? HECK YESSSS! Love love love this- thanks for sharing! 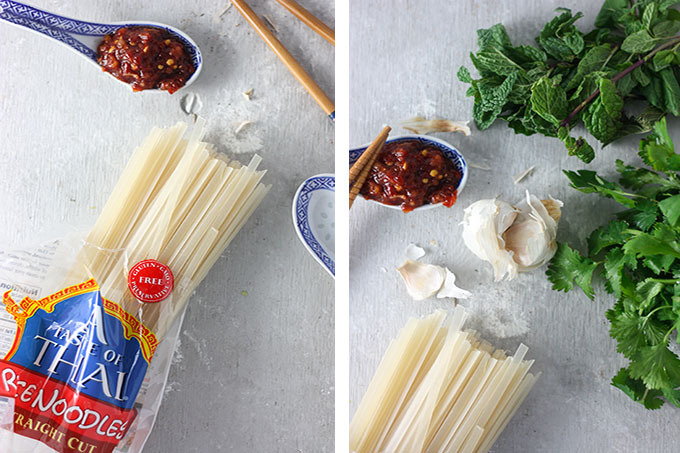 We don’t have any restaurants within a 2 hour drive that serves pho, so I can’t wait to make this!! Nooooo that sounds terrible I can’t imagine not having a decent Asian restaurant at hand. I hope you do end up making this! it is so, so easy and delicious 🙂 thanks for stopping by Lynne!